Christine Myes serving supper To David & Eileen Spear. 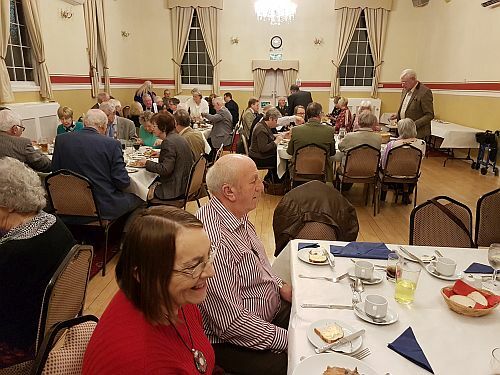 80 people sat down for to an informal dinner for the annual Friends of the Warrington Museum of Freemasonry supper and talk, which took place on 12 February 2018. 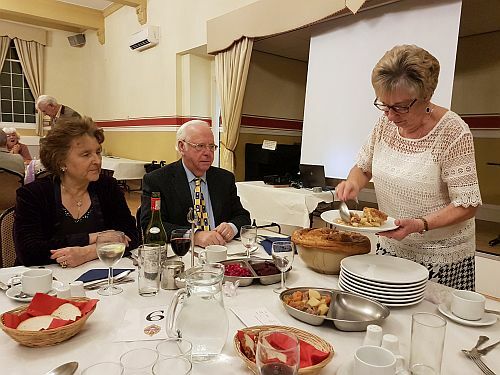 The main dish on the menu was the very popular Lancashire Hot Pot served with the traditional red cabbage and beetroot, which was very much enjoyed by all. Friends of the Museum supper February 2018. 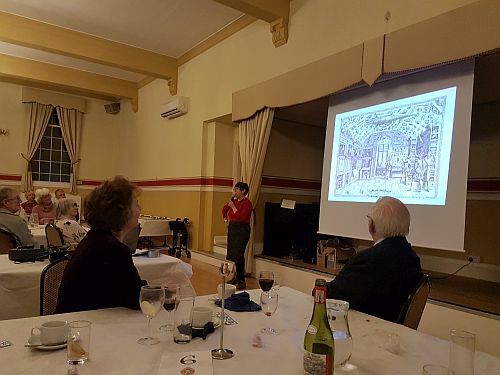 Following dinner, Barry Jameson, chairman of the board of trustees for the Warrington Museum of Freemasonry, gave a brief summary of the progress towards Accreditation for the Museum, explaining that the approximately 90% of the hugely large and complex application had now been completed and it should be ready for the submission deadline of 17 April 2018. Barry thanked the Friends of the Museum for their continued support and asked that any of the guests who were not already Friends, to consider taking out the modest £10.00pa membership. Janice Heyes presenting her talk. Janice Heyes, heritage manager for Culture Warrington then gave a talk on the history of the Warrington Museum and Art Gallery, which is the oldest museum in the north west and this year is celebrating it’s 170th anniversary. Janice explained that the museum was originally built as museum and art school, but both the art school and museum expanded to such an extent that a separate art school was eventually built. The museum building was extended several times, the last extension being built in the 1960’s. The various stages of expansion of the museum lead to changes and modernisation of the various galleries within the museum. However, the large statue of St Michael slaying the devil, which was originally in one of the galleries, is now in the Museum foyer since it can no longer be fitted into a gallery without further structural changes to the building. Story and pictures by Chris Betts.